Habit: Exothea paniculata grows as a medium to large tree to 20 meters in height with a trunk to 50 cm in diameter. The evenly bipinnate leaves are arranged alternately with 4- 6 leaflets. The leaflets are oblong to lanceolate, to 14 cm in length with an entire margin and acuminate leaf apex. The actinomorphic flowers are arranged in panicles. Flowers can be hermaphroditic or monoecious. The calyx has 5 green unfused sepals. The corolla has 5 unfused white petals. There are 5 unfused stamens. The ovary is superior with 2 locules and numerous seeds. 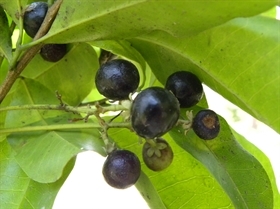 The fruit is a berry that is dark purple or black at maturity. Habitat: Exothea paniculata grows in Dry Broadleaf Evergreen Formation- Forests/Shrublands (coppice). Distribution in Bahamas/Globally: Exothea paniculata occurs in the central and northern island groupings of the Bahamian Archipelago as well as Florida, the Caribbean region and Central America. Medicinal/Cultural/Economic usage: Exothea paniculata is not used medicinally in the Bahamas. It has been used for cabinetry, making tool handles, toy boats for children and other toys. Exothea paniculata is used in the horticultural industry.